Kampot, 캄보디아의 더 플랜테이션 | 호스텔월드에서 예약하세요. Located across the Praek Tuek Chhu River a mere 15 minute walk from the heart of Kampot, The Plantation is delighted to accommodate you on our slowly growing fruit forest. 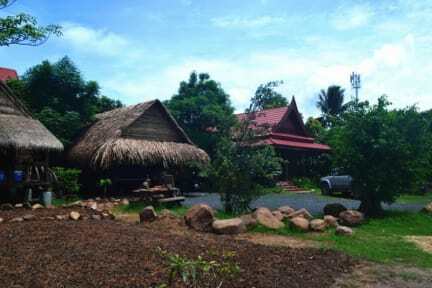 Our property, and your accommodations are surrounded by a myriad of tropical plants, not limited to mango, coconut, dragon fruit and bananas, and of course a few Kampot pepper plants. After a day full of exploration in the surrounding province, rest easy in the tranquility of our rural getaway. Join us in the evenings for a game of volleyball, a round of boules(petanque/bacci), cards or other board games, or enjoy relaxing in the garden, or in one of our hammocks. Our accommodations range from a Private Bungalow (complete with private bath), two dorms, to simple bamboo mats located under the trees around the property. 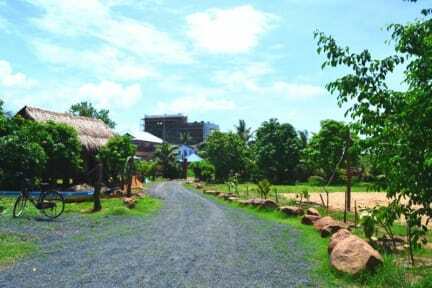 One dormitory is situated in a traditional Khmer home, while the other is a recent construction of 100% bamboo. All beds come with mosquito nets, linens, and towels. There are 5 shared toilets and showers for guest use. The Plantation Bar and Restaurant is pleased to serve you breakfast, lunch, and dinner. The kitchen is open between 7:30 a.m. – 9:00 p..m., and the bar has an approximate closing time of midnight. Draft beer and mixed drinks are available at our Bamboo Bar all day. Other amenities include tourist information, free maps, motorbike rentals, and bus ticket booking for both local and international routes.